Did You Know that the “Rapture” is an Appendix that was Tacked on to the Bible 1800 Years After Jesus? It’s hard to believe but because of one tiny pebble on an old dirt road, thousands of Christians believe in the Rapture. Pro tip, it’s not canon. Adherents of this perspective are sometimes referred to as premillenial dispensationalists, but amongst them there are differing viewpoints about the exact timing of the event. The term is most frequently used among Christian theologians and fundamentalist Christians in the United States. Who were the people responsible for corrupting the bible? Scofield was an alcoholic district attorney who was paid money to re-write the Bible into a corrupted version called the Scofield Bible. In 1871, Scofield was elected to the Kansas House of Representatives, first from Atchison for one year and then from Nemaha County for a second. In 1873 he worked for the election of John J. Ingalls as senator from Kansas, and when Ingalls won, the new senator had Scofield appointed U. S. District Attorney for Kansas—at 29, the youngest in the country. Nevertheless, that same year Scofield was forced to resign “under a cloud of scandal” because of questionable financial transactions, that may have included accepting bribes from railroads, stealing political contributions intended for Ingalls, and securing bank promissory notes by forging signatures. It is possible Scofield was jailed on forgery charges, although there is no extant evidence in the public records. He was also a bad Christian for divorcing his wife. Here’s the critical part that Darby tacked on that forever corrupted the way that Christianity is taught to Evangelicals in the US. And over time, people just assumed that he was referring to a PHYSICAL AREA OF LAND with all the bells and commercialist accoutrements it comes with, instead of the original meaning which was THE CHURCH. The people who believe in Jesus. Lmao at the picture up top. It finally happened. Somebody called this blog anti smitic. If only people would read the facts and dive deep into real world events. -The cruel treament of Palestinians is something that is consistently addressed by the United Nations. -The International Criminal Court acknowledges that Israel is responsible for hundreds of crimes against humanity. -Haaretz and even the NYTimes confirm that AIPAC has an unmistakeable control on American politics. -Al Jazeera has an internationally recognized documentary on how Israeli spies bribe politicians in the UK and in the US. The truth hurts, and accusations of anti smitism is how they try to censor it. Next up: How Zionism is not in the bible. This is Herzl. 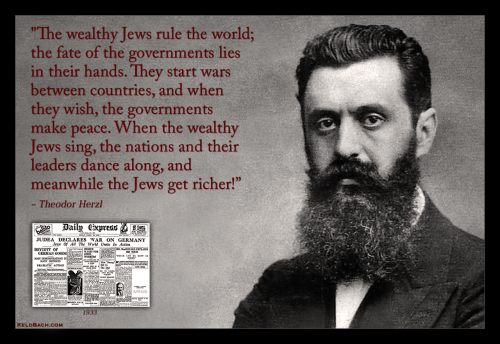 The man who created the Zionism political movement. Impossible. 90% of my sources are Jewish. I frequently feature jewish authors and journalists. Palestinians are the descendants of Shem and are therefore “semites,” so getting down to brass tacks, I’m pro-semite. At the same time, my views are aimed at benefiting and improving the image of the Jewish people globally, but anti-semites never listen and continually seek to do the opposite, subsequently degrading the image of the Jewish people through selfish actions that ultimately are their own. Bernie Sanders, Jill Stein, Noam Chomsky, Larry King, all of which are very influencial jews in their respective fields. I’ve praised Donald Trump who is Jewish and many others who aren’t famous but are actually Jewish. Wow. I guess I hit a nerve, and you did not observe my tongue in cheek remark above for what it was. The only thing I will say is that you have misinterpreted my views on Hitler, and likely on other thing, too. But, consider, what is often tagged as “white supremacism” is effectively a catch-all term. Under that umbrella term, are what are more correctly identified as ethnic European separatists. Many of these folks are angry at what has been done to their countries and culture by mass immigration from non-Western countries. And, guess what? Assimilation is not working as the immigrants come to change their new host countries. Now, if you think that is off the mark, just ponder that the flow of people is into ethnic European nations. We do not see millions of folks storming into China, or India, or Japan, or into any African or Latin American nations, do we? I’m really sorry for that. I know I sounded a bit rude. I wrote that reply before reading some of your other comments, and also before pondering on the thing that you are currently working on. Reality vs perception. I think that it’s a work in progress? I’m looking forward to how you expand on that in your upcoming posts. I agree that “white supremacism” is a catch-all term, just “like anti-semitism.” I was reading up on what people had to say about Zionism this morning on Twitter and a lot of people were stressing that anti-Zionism does not equal anti-semitism. It doesn’t appear to be an uncommon stance to take and I think this can be attributed to all the corrupt politicians who have come out of the woodwork in recent weeks, who have expressed their closetted islamophobia in public squares on the subject of Ilhan Omar and AIPAC. Many on Twitter have made it a point to mention that Ilhan never said the word “jew” in any of her criticisms of lobbying, and that she never criticized the jews in her criticism of “dual loyalty” congressmen. The open endedness of her criticism applies to any single country that lobbies US politicians, yet people like Graham, Engle, Pelosi, and Trump took it upon themselves to expose their dual loyalties to Israel by calling ilhan Omar’s comments anti-semitic. No-one even had to lift a finger. I have to wonder if it was just dumb luck or if Ilhan planned for it to happen this way. At any rate more and more people are realizing that AIPAC does keep its hands tightly gripped on US policians’ throats and not even the president of the United States has the power to free himself from it. It’s a dangerous situation and we need to be aware of it. It’s quite true. America and the commonwealth nations. Wealthy and prosperous. Gilded halls and sanguine institutions protected by US forces. They’re the best there ever was, but in a twist of fate, everybody now wants to be a part of it. I used to tell people that if you’ve got something good going on, you have to keep it a secret, otherwise people are going to come and try to take it. It’s like skinny jeans and beards. It was cool before everybody started doing it. Western countries really just need to simmer down a bit, because mass migration is irreversible. Is it possible that the US will one day start genociding immigrants in a bid to control the “ethnic purity?” I’m certain that the potential is there. Congress and the shadow lobbies are psychopaths and there’s no telling of what they’re capable of. This entry was posted on 03/15/2019 by Digital Empire in NA, Religion and tagged Catholic, Christianity, Evangelical, Jesus, Martin Luther, Rapture.